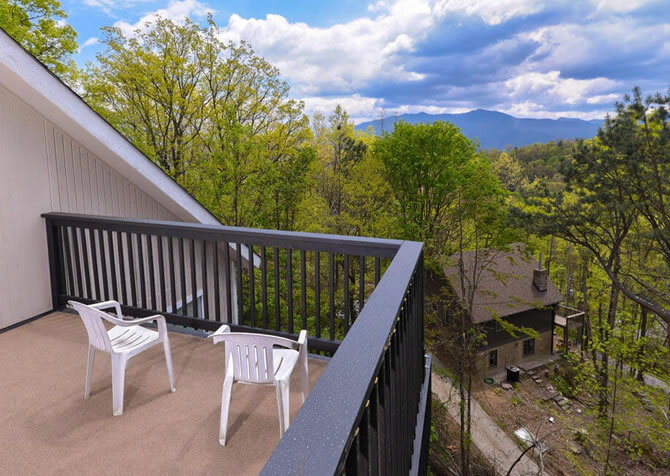 A gorgeous one bedroom, one bathroom studio-style cabin near downtown Gatlinburg, Seclusion is a luxurious retreat for a honeymoon or romantic weekend. The cozy 700-square-foot cabin is outfitted with gorgeous, stylish furnishings, luxurious amenities, and all the conveniences of home. 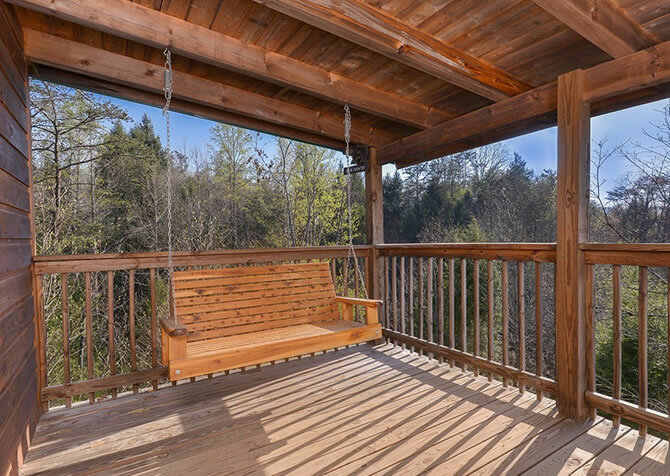 You'll feel pampered and completely secluded in this beautiful cabin in the Smokies. Seclusion is also just a few miles from downtown Gatlinburg, so you'll be near all the excitement this charming mountain town has to offer. Just about two miles from downtown Gatlinburg, Seclusion is a quick drive from the area wineries, local attractions, outlet stores, the Great Smoky Mountains National Park, and dozens of restaurants to please any palate. Gatlinburg has something for everyone, with Italian, Mexican, Japanese, American, Chinese, and Southern cuisines, along with seafood, steak, desserts, and fast food restaurants. If you'd rather have a romantic meal in the cabin, Seclusion boasts a gorgeous and fully-equipped kitchen and a lovely dining area with room to seat four. Stainless appliances and upscale décor will be a chef's dream. There is also a charcoal grill outside for cooking up juicy steaks, burgers, and veggies. Open to the living area is the luxurious bedroom and living area. The queen size canopy bed features beautiful, comfortable bedding and rich dark wood. A dresser with a lamp by the bed provides romantic lighting, and a small table by the bed is topped with a chess board. The comfy bed faces the big flat screen TV with DVD player, so you can enjoy movies and TV from bed. 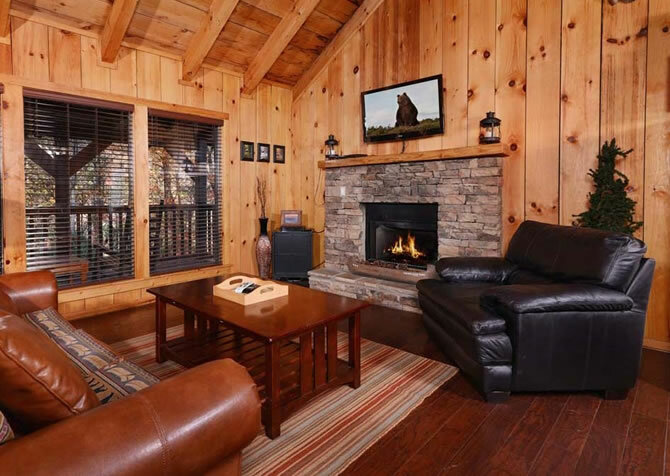 The living area features plush seating flanking the wood-burning fireplace, so you can curl up and enjoy some romantic time on those cool Smoky Mountain evenings. This beautiful space is a great place to relax and spend those special moments. While the space is warm and cozy, the high ceilings keep it feeling open. In the bathroom, pamper yourself (or that special someone) with a soothing soak in the jetted tub. Add one of our gift baskets for extra luxury. They're filled with candy, bath products, romantic gifts, and more. Want to make your time in the Smokies feel even more special? Schedule an in-cabin massage for the two of you! The detailed tile work makes the shower and tub a showpiece in this spa-like bathroom in Seclusion. 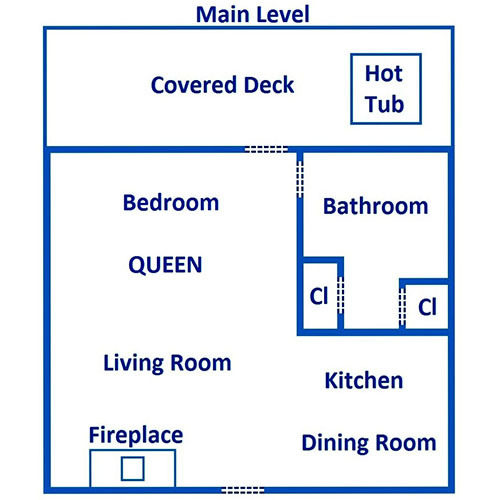 When you want a breath of fresh air, head out onto the deck. 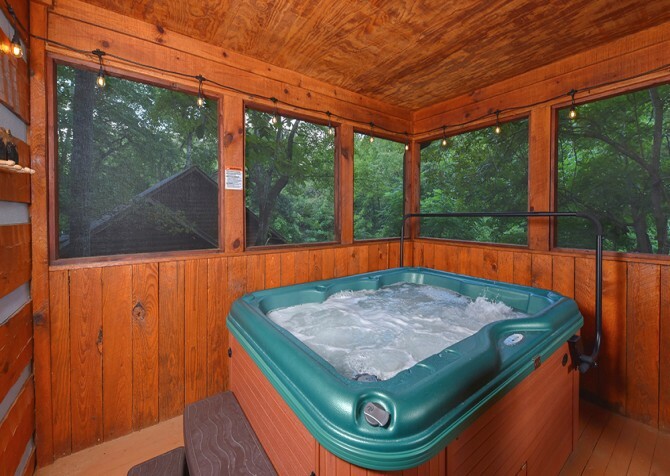 Soak tired muscles in the hot tub, have your morning coffee, or enjoy a glass of wine as you sit back in the deck chairs and relax. The peaceful wooded surroundings will engulf you in serenity as you enjoy your honeymoon, family vacation, or romantic weekend with the one you love. Another convenience at Seclusion is the high speed Internet available. If you're planning to visit area attractions, make dinner plans in town, or stop by one of the local events, you can use the Internet to look up coupons for tickets, choose restaurants, and find out more information about events. Perfect for a honeymoon or romantic weekend away (or some alone time), Seclusion is a luxurious one bedroom, one bathroom cabin with comfortable interiors, beautiful furnishings and décor, lovely wooded views, and many amenities. Spend days relaxing in the cabin or take a short drive to downtown for dining and entertainment. "We absolutely LOVE this cabin! It is so beautiful inside. We have stayed at this cabin twice and so far it’s our FAVORITE! Thank you for the 40% off sale :)!" Thank you so much for taking time to leave us a review. We are so happy that you chose to stay with us again. Seclusion is a great cabin, and we a thrilled that you think the same as we do. We greatly appreciate guests like YOU, and we cannot wait to continue serving you in the future! "PERFECT HONEYMOON SPOT! Seclusion is an amazing cabin, and we will definitely be back!" "The cabin was great! We stayed in Seclusion. Only negative was driving up that mountain lol! When they say steep driveway, they mean steep driveway!"